I started wearing reading glasses long ago, everyone in my family does, so for me it’s actually not a flaw, it’s just normal! I think no one is perfect. There’s no such thing as perfect body and soul (well, except from Miguel! Ahahah!). Perfection is about how each one deals with their own imperfections, how you interpret them and what your attitude about them is. 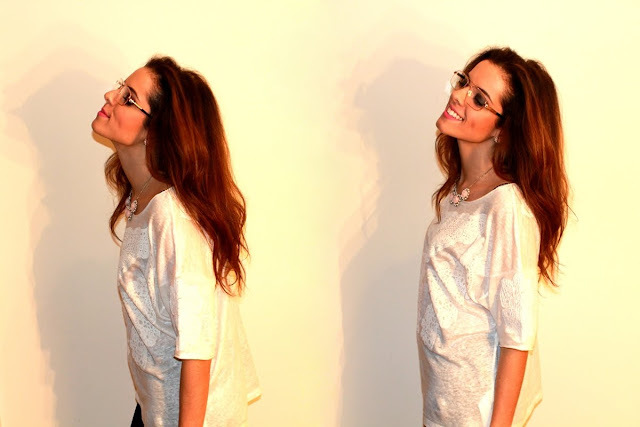 And I was lucky with this little imperfection of mine, because glasses can be such a great fashion accessory! It’s amazing how a pair of glasses (either reading or sunglasses) can totally change a look! Actually, even if I didn’t have to wear glasses I would still choose a pair to wear sometimes! I found these ones on Firmoo and I couldn’t wait to try them out! What do you think? Comecei a usar óculos há já algum tempo, todos na minha família usam, por isso para mim não é verdadeiramente uma falha, é apenas normal! Acho que ninguém é perfeito. Não há corpos e almas absoluta e cientificamente perfeitos (bem, com exceção do Miguel! Ahahah!). Perfeição é a forma como cada um lida com suas próprias imperfeições, como as interpreta e qual é a sua atitude em relação a elas. Eu tive sorte com esta minha pequena imperfeição, porque os óculos podem ser um ótimo acessório de moda! É incrível como um par de óculos (ou leitura ou de sol) pode mudar totalmente um look! Na verdade, mesmo que eu não tivesse que os usar, escolheria uns para usar de vez em quando! Encontrei estes na Firmoo e não podia esperar para experimentá-los! O que acham? Glasses thanks to Firmoo. Zara t-shirt. São muito giros Leonor :) Adoro a blusa! from them and they're so much fun to wear. I don't even need glasses; the're non-prescription. But I love them. I especially like to wear fun lipstick with them. Makes for a much more whimsical look. I really like your necklace! So cute! You are very photogenic and charismatic! The glasses did not highlight it! I was thinking about that collab with Firmoo too but i said no in the end because i never use glasses so... it's not a big deal for me XD You look fantastic!! Funny photos :)) look great! woah i love your look when you wear glasses <3 you look so wonderful then! Wow!! Love the glasses dear!! You looks great!! Nice glasses! you looks so great! Of course your glasses are the epitome of chic! Glasses are so cute and you looks very good! you look great in those! the written text on your content are running off the screen. They really suit you, I love them!